Recover Keys is a program that diagnose your system to search and recover or retrieve all genuine and valid product keys which also known as serial numbers for all installed software. Recovery Keys then makes a backup of the list, or users can opt to just viewing the keys, print the list or save to a text file. The software is useful if you have lost or forgotten the serial keys, especially the utmost important activation keys for Windows operating system or other major software you purchased, which must be used when you want to re-install them again. Unfortunately Recovery Keys is not a freeware, and costs $19.95 USD to register. But now you have a chance to legally download and install Recovery Keys, and use the software for unlimited period genuinely provided you install Recover Keys during the Giveaway period (that’s today, now, for about 22 hours more to expiry), thanks to giveawayoftheday.com. Download free version of Recover Keys (offer expired). 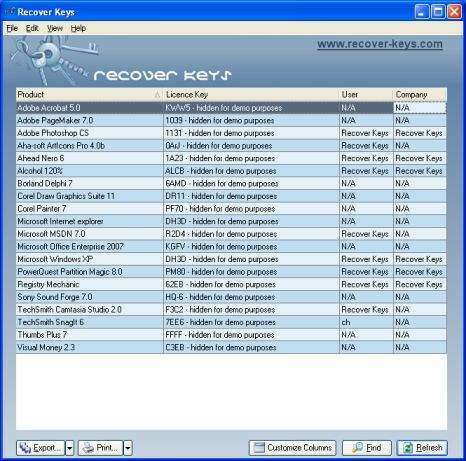 The Recover Keys free license download is fully functional, but can only be used for personal use, provides no free technical support and no free upgrades to future versions. If you prefer to buy, you can try out the software first by downloading the Recover Keys demo version. Giveawayoftheday.com is giving away Recover Keys again on Jan 1, 2009. Recover Keys now supports more than 8000 software applications, including but not limited to Microsoft Windows, AutoDesk 3DMax, Microsoft Office, Registry Mechanic, Alcohol 120%, Ahead Nero, Acronis Products, SlySoft CloneCD, Corel Draw, Camtasia Studio, O&O Products, Symantec Products, ACDSee, Electronic Arts, Macromedia, Adobe Photoshop, Roxio, Tag&Rename, Ulead Products, Unreal Tournament, VMware Workstation, WinZIP, Winamp, Ashampoo Products, Adobe Acrobat, Adobe Illustrator, Adobe Premiere and so on. Previously, the software supported by Recover Keys to retrieve the registration keys include ACDSee 5, ACDSee 6, ACDSee 80 Pro, ACDSee 80, ACDSee 9, Adobe Acrobat 4.0, Adobe Acrobat 5.0, Adobe Acrobat 6.0, Adobe Acrobat 7.0, Adobe Acrobat 8.0, Adobe Illustrator, Adobe PageMaker, Adobe Photoshop CS, Adobe Premiere, Advanced Archive Password Recovery, Age Of Mythology, Ahead Nero 6, Ahead Nero 7 Premium, Alcohol 120%, AllNetic WorkingTimeTracker, ArtIcons, Ashampoo Antivirus, Ashampoo AudioCD MP3 Studio 3, Ashampoo Burning Studio 7, Ashampoo Movie Shrink & Burn 2, Ashampoo PowerUP XP Platinum 2, Ashampoo UnInstaller Platinum, Ashampoo WinOptimizer 4, Autocad R16, Autodesk 3dsmax 7.0, Autodesk 3dsmax 8.0, Battlefield 1942: Secret Weapons Of WWII, Battlefield 1942, Belarc Advisor, Block Website Buddy, Borland Delphi 6, Borland, Delphi 7, Call Of Duty: United Offensive, Call of Duty, Check It Utilities, Command, and Conquer – Red Alert 2, Command and Conquer – Tiberian Sun, Corel Designer, Corel, Draw Graphics Suite 11, Corel Draw Graphics Suite 12, Corel Draw, Corel Painter 6, Corel Painter 7, Corel Quattro Pro, Corel Ventura, Corel WordPerfect Suite, CyberLink, PowerDVD, DU Meter, Fresh Devices – Diagnose, Fresh Devices – Download, Fresh Devices, – UI, Fresh Devices – View, ISO Buster, Macromedia Captivate, Macromedia Contribute, Macromedia Director, Macromedia Dreamweaver 4, Macromedia Dreamweaver 5, Macromedia, Dreamweaver MX, Macromedia Fireworks, Macromedia Flash 5, Macromedia Flash 6, Macromedia Flash 7, Macromedia Flash 8, Macromedia FreeHand, Macromedia Homesite, Medal Of Honor: Allied Assault: Breakthrough, Medal Of Honor: Allied Assault: Spearhead, Medal Of Honor: Allied Assault, Medal Of Honor: Pacific Assault, Microsoft, Communicator, Microsoft Exchange, Microsoft Interactive Training, Microsoft Internet, explorer, Microsoft Money, Microsoft MSDN 7.0, Microsoft MSDN 8.0, Microsoft Office 11.0, Microsoft Office 12.0, Microsoft Office FrontPage 2003, Microsoft Office OneNote, 2003, Microsoft Office Outlook 2003, Microsoft Office Pro Plus 2007 (Beta), Microsoft Office Project 2003, Microsoft Office Visio 2003, Microsoft SQL Server 2000, (8.0), Microsoft SQL Server 2005 (9.0), Microsoft Visual Basic .NET 2003, Microsoft, Visual Basic 2005 Express, Microsoft Visual C# 2005 Express, Microsoft Visual Studio, .NET 2002, Microsoft Visual Studio .NET 2003 Enterprise Architect Edition, Microsoft, Visual Studio .NET 2003 Enterprise Developer Edition, Microsoft Visual Studio .NET, 2003 Professional Edition, Microsoft Visual Studio .NET 2005, Microsoft Visual Studio, 2005, Microsoft Visual Web Developer 2005 Express, Microsoft Windows OS, Microsoft Works, Need For Speed: Most Wanted, Norton System Works, O&O Defrag Professional, Omnipage 2, PowerQuest Partition Magic, Registry First Aid, Registry Mechanic, RegistryFix, Resonantsoft DupeWatcher, RollerCoaster Tycoon 3, Roxio Easy CD Creator, Setup Factory 6, Sibelius 4, Sim City 4 Deluxe Edition, SoftLogica Backup Platinum, SoftLogica Handy Recovery, Sonic RecordNow, Sony AC-3 Encoder, Sony MC MPEG Plug-In, Sony Noise Reduction, Sony Sound Forge, Star Wars: Republic Commando, Stardock, ObjectDock, Steganos Secure VPN, TechSmith Camtasia Studio, TechSmith SnagIt, The Sims 2, The Sims Nightlife, The Sims University, The Sims, Thumbs Plus 5, Thumbs Plus 7, TuneUp Utilities, Ulead Video Studio, Unreal Tournament 2003, Unreal Tournament 2004, Visual Money 2.3, VMware Server, VMware Workstation 4.0, VMware Workstation 5.0, WinISO, WinZIP, Xara XS, ZoneAlarm.